This past June, the U.S. Supreme Court issued a decision that is the culmination of years of effort by anti-labor interests to permanently hobble organized labor in the United States. The argument made by the plaintiff in Janus v. AFSCME, Mark Janus, was that since he did not agree with the union’s political stances, he should not have to pay “agency fees,” the money collected by the union from nonmembers who still benefit from union work. In the 5-4 ruling, the Supreme Court eliminated the ability of unions to collect agency fees from nonmembers on the grounds that these fees represented an infringement upon on nonmembers’ First Amendment rights. The decision in this case is the work of anti-labor interests across the United States. Corporations, such as Koch Industries, have bankrolled anti-labor groups including, The National Right to Work Foundation and the Freedom Foundation, in an effort to undermine workers’ rights in the U.S. These businesses have made no effort to hide their allegiances: the goal of business is to make a larger profit and the easiest way to save money is to pay your workers less. Data from the U.S. Bureau of Labor Statistics (bls.gov) continue to show that in nonunionized workplaces, employees make substantially less money and receive fewer benefits from employers. Prior to the Janus decision in June of 2018, anti-labor interests were slowly whittling away workers’ rights state by state, but this decision marked the first nationwide victory for these anti-worker groups. In the wake of the decision, there have been articles and essays about what the labor movement needs to do to survive this decision. I would argue that the best answer to this question is to look back at where we’ve come from. We need to draw inspiration from the women and men who have led our movement. We must remind ourselves that the victories won by unionism were not given to us, but rather fought for by those who came before. Once we do that, we must look forward and envision what we want our union to stand for. 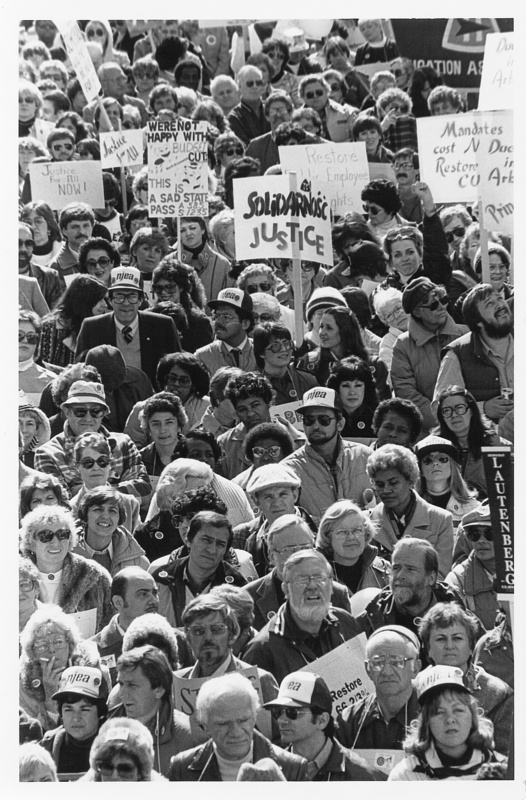 At a rally in the early 1980s, NJEA members showed up in force to protest school funding cuts, while making connections to the labor movement in Eastern Europe—particularly Solidarity in Poland. Please forgive the following foray into U.S. labor history. I am a history teacher by trade and a firm believer that some of the most important lessons can be learned by looking to our past. Workers unions in the U.S. were not born in one particular place or at one particular time, but perhaps one of the most important moments of the early labor movement was the Pullman Strike of 1894, led by the American Railroad Union (ARU) and Eugene V. Debs. In response to massive layoffs and wage cuts, the ARU helped to organize a nationwide boycott and strike by railroad workers, many of whom were people of color. The strike was not popular among many in the country. President Grover Cleveland was pressured to end the strike. He called in federal troops to it put down. In the aftermath of the strike, and in an effort to appease organized labor, Cleveland pushed a bill through Congress that created Labor Day. While the Pullman Strike has been deemed unsuccessful by the history books, it helped to convince workers that organizing is beneficial to them and their communities and helped to spur a wave of organizing throughout the early 20th century. Union membership grew during and immediately after World War II when almost 35 percent of American workers were unionized. Groups such as the American Federation of Labor and the Congress of Industrial Workers championed organized labor and its benefits. Throughout the country, workers of all trades began to organize and work to secure better pay, better working conditions, and a wide variety of other benefits for not just their members, but all workers in the industries. Their victories affected all Americans, from the advent of the five-day work week and the eight-hour work day to the inclusion of health insurance as a benefit of employment. These victories were not given, but won through countless hours of negotiations, organized protest, and public pressure on employers. With the advent of anti-worker sentiment in board rooms and the U.S. political machine, the number of American workers who were unionized began to drop in the 1970s and 1980s to a decades-low percentage now. Anti-labor interests have found ways to reach American workers and convince them that the benefits of organized labor can be had without the actual organizations who fight for workers. In fact, the opposite is true. Unionized workers command a higher wage and better benefits than nonunionized workers. This has put the American labor movement in a more difficult position, but in order to maintain these victories, we must learn from the examples of leadership and organizing that got us this far. Luckily for us as NJEA members, we have a wealth of examples to look back on and draw inspiration from. NJEA was founded in 1853 with the intent of improving not just the lives of its members, but to improve the state of public education in New Jersey. Throughout our 165-year history, we have been able to accomplish just that. From the establishment of public education for all in 1874 to the enacting of the first minimum salary law in 1919, NJEA has a long history of advocating for members and those we serve. This work has been done in a multitude of ways: state leaders have successfully advocated on a state level for collective bargaining rights in 1968 and sick leave banks in 2007, while local leaders have fought for their members and students each and every day. To this day, the work of the NJEA affects its members in noticeable ways. 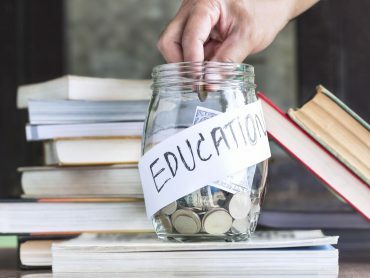 In New Jersey, the minimum starting salary for a teacher is $18,500, but through collective bargaining and public pressure, there are no school districts in the state that offer compensation that low for teachers. Like the larger labor movement, these victories were hard-fought. It was through political and social organizing that these gains were able to happen. To paraphrase an old adage, victories are won by those who show up. The reason why the NJEA has been as successful as it has in advocating for our membership and our communities is that the folks who make up the movement—all of us—have historically been some of our best advocates. However, in the wake of the Janus decision we need to continue the good work of those who came before us and look for new ways to advocate for members and our communities. As we look through the history of organized labor both nationwide and in the NJEA, one thing is clear: in order to have a strong union, there must be members willing to give their time and energy to the union. All of the best examples of effective organizing required the effort of large numbers of union members. However, it would be wildly unreasonable to assume that every member of the NJEA can give everything to the movement on any given day. All of us live full lives outside of our careers. But we can undoubtedly do something small each day to improve the worklives of fellow members. With that in mind, I would like to advocate for an expanded idea of what unionism is and what NJEA membership looks like. This idea is built from my understanding that NJEA is more than just an advocacy and organizing tool for its members. NJEA and its membership are some of the last places that school employees can find each other and build spaces entirely for themselves. While organized labor has been under attack over the past few decades, it has been especially difficult to work in public schools. We have been used a political punching bag by a number of state and federal administrations, and we have been used as a piggy bank for our boards of education. Nevertheless, we persisted. Those who work in schools know that it is a unique working environment. The stories that NJEA members share with each other are unlike stories from any other occupation and the union is one of the last remaining places that we can go to feel heard and understood. 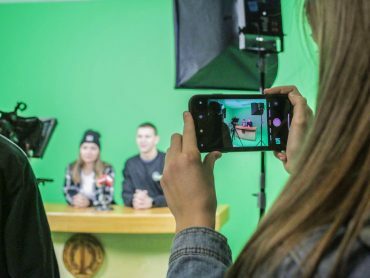 With this in mind, my reimagining of active NJEA membership includes small gestures like checking in on a colleague or offering a fellow member a helping hand. In these small ways, we can remind each other that union membership means knowing someone has your back. While small gestures should be one of the pieces of union membership, we must not forget that we are our own best advocates. NJEA, as an organizing and advocacy force, is only as strong as its members. Advocacy and organizing can take many forms and as members we can, and should, participate in any way we can. 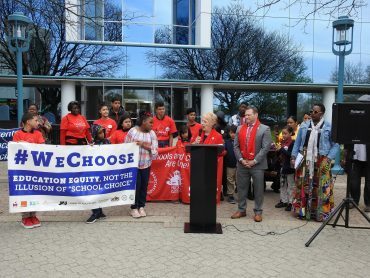 Over the past decade local associations have organized using tools such as letter writing campaigns, member speakers at board of education meetings, and as a last resort, teacher strikes. However, it’s important to remember that these efforts only work with participation from membership. If we want to create a better learning environment for our students or advocate for a change in how we pay for health insurance, we need to participate in organizing activities. As I noted earlier, the anti-union forces have been organizing and showing up for years. While the NJEA has a strong history of advocacy and organizing, this should be a prescient reminder that we need to redouble our efforts. Unionism can no longer be a spectator sport. Robert Mangel is a social studies teacher at Linden High School and a member of the Linden Education Association. He is also a member of the NJEA Early Career Network leadership team. Robert can be reached at robmangel@gmail.com.